To celebrate Christmas and the holiday season, a special “Sarabeth’s Original Christmas cake” can be purchased at all Sarabeth’s locations in Japan, limited to orders made in advance. We accept orders through Monday, November 28th to Friday, December 16th, 2016 and the cake will be available for pick-up through Thursday, December 22nd to Sunday, December 25th. 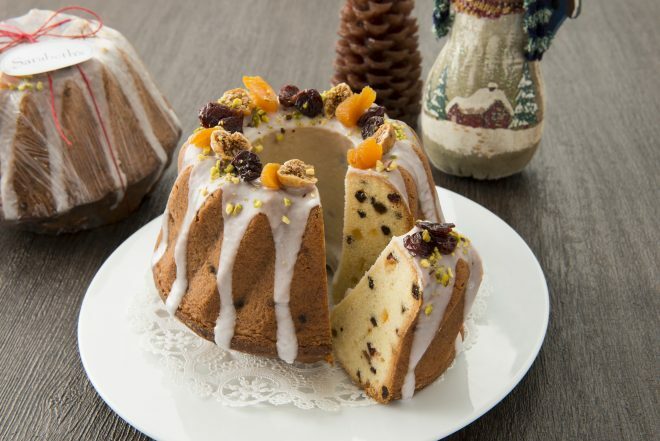 This beautiful Christmas cake is a pound cake with delectable dry fruits such as figs and apricots baked in a Gugelhupf tin. Enjoy the simple yet elegant cake that is moist with aroma of liquor. ・Please make an order by phone or by visiting one of the above stores. ・Kindly note that the order will not be completed until payment has been confirmed. ・Orders accepted through Monday, November 28th – Friday, December 16th, 2016. ・Available for pick-up through Thursday, December 22nd, to Sunday, December 25th, 2016.